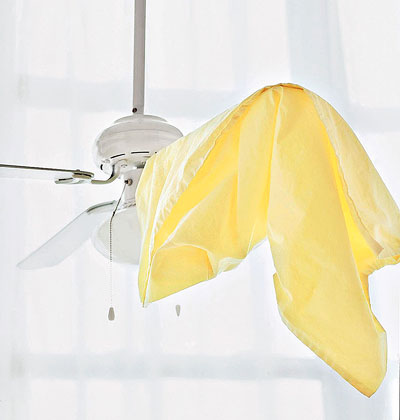 Kate and Oli: How To Clean Your Ceiling Fans With No Mess! I found this tip on pinterest, by way of Real Simple. Everytime I try to clean my ceiling fan, dust falls all over my bed! But this worked! And it was SO easy. I'm not going to post a picture of my pre-clean ceiling fan because it's gross, but you know how it builds up on the sides and you can see it from below? Yuck. Now, all you do is take a pillowcase (longer than your fan blades), hold one side of the open side in your hands, and roll it up like you would a wrapping paper roll. Then you slide it over the fan blade, careful not to disturb the dust until you're ready! Once the pillowcase is over the whole blade, just slide your hand (over the case) down the blade, wiping all of the dust into the pillowcase! So easy! I used the same pillowcase for all 5 of my blades and while I was up there, I dusted the rest of the fan. Once you're done, take the pillowcase outside, turn it inside out, shake it out, then wash it like normal. Voila! Clean ceiling fan with NO mess!